From May, 2000 issue of The Front Porch News, the Whiteaker Community Newsletter. "Would the valleys were your streets, and the green paths your alleys, that you might seek one another through vineyards, and come with the fragrance of the earth in your garments. But these things are not yet to be." - Kahlil Gibran, 1923. The Food Not Lawns garden here in Whiteaker is in its second season of growing food and medicine to give away to the local homeless and hungry, in the form of hot cooked meals and fresh produce; and as heirloom seed. We use no chemicals and are striving toward an "edible forest" type of low-maintenance, perennial food ecosystem. Our garden is grown according to the Stella Natura calendar and with the help of biodynamic compost preparations and field sprays. All told, it represents one of the most avant garde urban farming experiments in the country. This is a busy year for us. With Eugene enjoying the highest per capita consumption of organic food of any city nationwide, so correspondingly, the city has quietly stepped into the spotlight as a key link in the global "food intelligence" network. And right here in Whiteaker, The Food Not Lawns collective has emerged as one of the more active national clearing-houses for information on "food integrity" both here and abroad. Currently, a key focus of ours has been publicizing the story around genetically engineered food ("Frankenfoods"). With little or no regulatory constraints, labeling requirements or scientific protocol, the global fight for market share has led the few companies involved to suddenly and massively deploy transgenic crops around the world. The result? Most processed food items in our local supermarkets and convenience stores already "test positive" for the presence of genetically engineered ingredients. If you're eating out, you're eating Frankenfoods. Meanwhile, evidence continues to mount that the headlong rush for profit is unleashing forces that may yet kill rather than feed millions. If you didn't know this, you're not alone. All but the tiniest fraction of Americans have any idea what's been going on. The science is complex and, for complicated reasons that have largely to do with the fact that the biotechnology industry is profit- rather than need- driven, both Congress and conventional media have largely ignored the issue. Indeed, attempts by concerned citizens to learn and share intelligence on the Genetically Modified Organism (GMO) story continue to be actively suppressed both here and abroad. For the most part, the cover-up has worked. In our own local outreach efforts, we have found that organic farmers in Lane County, traditionally one of the savviest farming constituencies in North America, remain unaware of key recent developments in this arena. But how might this all affect you, you wonder? Well, is the 4J school district feeding your children cabbage containing scorpion genes? Is the corn you're eating killing butterflies in the fields? What are the possible consequences of growing and consuming these already-existing genetic mixes? There's little point asking officials what your children's food is these days, or whether it's safe. They, like your local supermarket, simply have no way to know. And if someone pretends to know, they're either lying, or being lied to. Likewise, fleeing into the "organics" label provides no guarantees either. We are already seeing organic farms contaminated by genetic drift from neighboring GE crops, and this contamination carried through to the shelves of health food stores. The same wind is beginning to blow through the Willamette valley. But if the business and political establishment has been party to arguably one of the most spectacular cover-ups in history, at least this time they have proved once and for all that there simply is no money to be made nurturing self-supporting ecosystems or, to put it another way, there is no economic incentive to truth. The Food Not Lawns experiment is a response to such wanton carelessness and greed. On the one hand we're alerting people to the facts of the GMO story with handouts, email, video and word of mouth: on the other, we are exploring workable, grounded alternatives to see our own community out of this mess. There is no Grand Plan. The map is the territory as they say; and whoever participates is helping make it up as we go along, day by day. We are all steering. What have we learned so far? Our experience seems to confirm Bill Mollison's dictum, that "the suburban family farmer is the savior of the world." In other words, taking responsibility for growing our own food and medicine in our own neighborhood is the easiest and most effective way of guaranteeing our own health and that of our particular patch of biosphere - fundamentally the same thing, it appears. But sustainable community gardening requires more than simply putting healthy seed in the dirt. Elementally, it involves people learning how to live and work together for the common health. What sort of change does this demand of us as individuals? How might community gardening act as both a catalyst and a framework for learning to share with one another? Our experience suggests that there's no way to answer these questions by sitting around in think-tanks, hypothesizing; issuing policy edicts from on high; or by waiting for the cavalry to arrive. We've gotta actually do it, by ourselves, here in Whiteaker, now. It is time. We are the ones we've been waiting for. Fortunately, we're finding that we're not without a Guide. We have a handmaiden in our Garden. She keeps us on track. That's because community gardening literally roots us in a common Truth, a Truth born of Nature, a Truth born of Interconnectedness. And as we keep pace with the earth, so her harmonies steward our lives. Perhaps this observation was what prompted Thomas Jefferson, in the autumn of his years, to observe, "No occupation is so delightful to me as the culture of the earth, no culture comparable to that of the garden, and though an old man I am but a young gardener." Please join us as partners by participating in the Cities to Gardens initiative May 15-19, during a week dedicated to sustainable living, using the Whiteaker community as a work in progress. 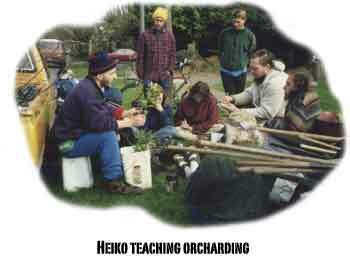 Try out our free workshops on permaculture, bio-intensive gardening, radical landscaping, native/medicinal herbs, composting, bikes/alternative transportation, dynamic facilitation, native plants, wild edibles, appropriate technology; a bike trip to Full Circle Farm and guerilla gardening actions. Or call us to organize or host a workshop of your own on any related topic. We are also looking for garden spaces for community gardens (parking lots, roadsides, empty lots, driveways, lawns) and extra gardening tools, seedlings, compost etc. We have seed to share for free. 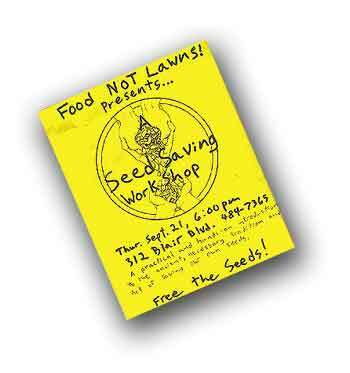 Supporters of the Cities to Gardens Initiative also include the Lost Valley Education Center, Approvecho, Full Circle Farm, and the Food Not Bombs collective.